Truth is not easily hidden. Conventional retail gasoline averaged $3.65 a gallon in the most recent week ended October 22, 2012, yet when Barack Obama was sworn into office the price averaged $1.88. When questioned about the 94.2% increase which occurred on his watch, Mr. Obama remarked that the reason gasoline prices were so low when he entered office was because the U.S.was “in the middle of an economic depression.” However, the question wasn’t why prices were so low when he entered office, but rather why they ballooned by 94.2% on his watch. We’re still awaiting his answer. In the second presidential debate, Barack Obama stated that, “oil imports are at the lowest levels in 16 years.” But as I pointed out in Debate 2 | Obama’s Oil & Gas Rhetoric, the gasoline I need to fill my tank only cost an average of $1.23 a gallon in 1996, the equivalent of $1.81 today. And later in the same debate, Obama proclaimed that, “oil imports are down to the lowest levels in 20 years.” Well, which is it Mr. President? I pointed out in the same post, that the 1992 price of regular unleaded averaged $1.13 per gallon, the equivalent of $1.86 today. Is the price of gasoline $1.81 to $1.86 today? No. So then what was Obama’s point? Are we supposed to believe that it took an economic depression to bring gasoline prices down to $1.88 in the week ended January 19, 2009, when that would actually have been higher than the average inflation adjusted price of $1.73 at that time? I don’t know what that tells you, but it tells me that gas prices were in a bubble before the Great Recession, a bubble which finally burst during month 8 of the 19-month downturn. High gasoline prices were actually one of the factors leading to the Great Recession, the subsequent decline merely brought prices in-line with the historic norm. 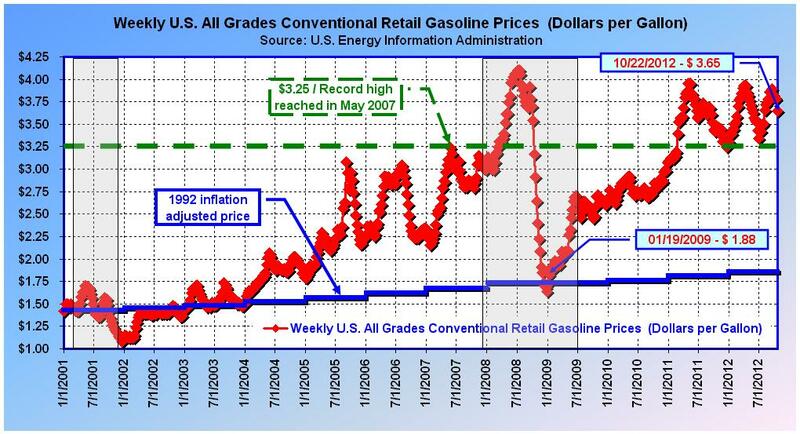 If this is true, then hasn’t the price of gasoline been in the midst of another bubble since 2011 (see chart below)? And if a bubble currently exists, does that mean the U.S. is either in or near recession? To know the answers, we must venture back in time and analyze what actually took place prior to the Great Recession. The following analysis focuses on all grades of conventional retail gasoline. Gasoline prices generally rise during the first six months of the year, and fall during the remainder. The 2001 recession began in March and ended in November, as indicated by the first shaded area in the chart above. 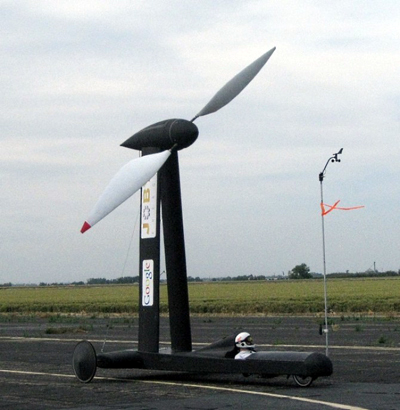 Going back to January 1, 2001, according to the U.S. Energy Information Administration, we find that conventional grades were selling for an average of $1.42 per gallon. Once the recession commenced prices peaked at $1.70 in May, before the normal seasonal decline. But due to the recession, followed by a post-911 reduction in demand, prices continued to fall reaching a low of $1.08 by the week ending December 18, 2001. This represented a decline from the peak of roughly 36%, over 32 weeks. Based on the 1992 price per gallon of $1.13, the 2001 equivalent price should have been $1.43 (as represented by the solid blue line). Due to the recession, gasoline prices temporarily declined below the inflation adjusted level, but would eventually regain equilibrium, reaching $1.46 towards the end of 2002. All in all, gasoline prices remained at or near equilibrium between 2001 and 2003. It was in 2004 when prices began to spin hopelessly out of control. The reason for the subsequent price hike was initially blamed on a significant number of refineries being offline, and later by rising crude oil prices. Prior to the Great Recession, a record high of $3.25 per gallon was set in the week ended May 21, 2007. The chart above contains a green dashed-horizontal line at the breaking point, the pre-Great Recession record of $3.25 a gallon. The solid blue line represents the annual inflation adjusted price of 1992 gasoline. Although gas prices may currently be on the decline, until they dip below $3.25 a recession threat remains. At the same time, any price above $1.86 is not optimal. So where are we today? The Great Recession commenced in December of 2007. At the time, gasoline was averaging $3.03 per gallon, but within the first eight months the price would set a new record of $4.10 per gallon in the weeks ending July 7 and July 14, 2008 (see chart above). But then something phenomenal happened. From the peak, prices declined to $3.17, or to below the $3.25 breaking point within just 14 weeks. And prices continued to fall all the way to a low of $1.64 by the week ending December 29, 2008, within another 11 weeks. So from peak to trough, gasoline prices declined by 60% in just 25 weeks, a notable difference from the 36% decline over 32 weeks at the end of the 2001 recession. After the 2001 recession prices remained relatively stable for two years, but that wasn’t the case with the Great Recession. This time, when prices hit bottom the recession wasn’t over. It probably should have been over at that point, and perhaps it would, had it not been for artificial demand, induced by an unprecedented amount of deficit-financed government intervention. By the time the Great Recession ended, the price of conventional gasoline had risen from a bottom of $1.64 to $2.64. So from an early Great Recession surge to $4.10, prices finally flushed out at $2.64. To summarize, during the Great Recession, gasoline prices rose by 35% before declining by 36%. By comparison, during the 2001 recession, prices rose by 20% before declining by 36%. That seems fairly harmless on its own, but what’s missing is the fact that gasoline prices doubled, from $1.50 to $3.08, during the previous recovery, between January 2004 and December 2007. That’s the key. There’s the bubble. So what was the cause? 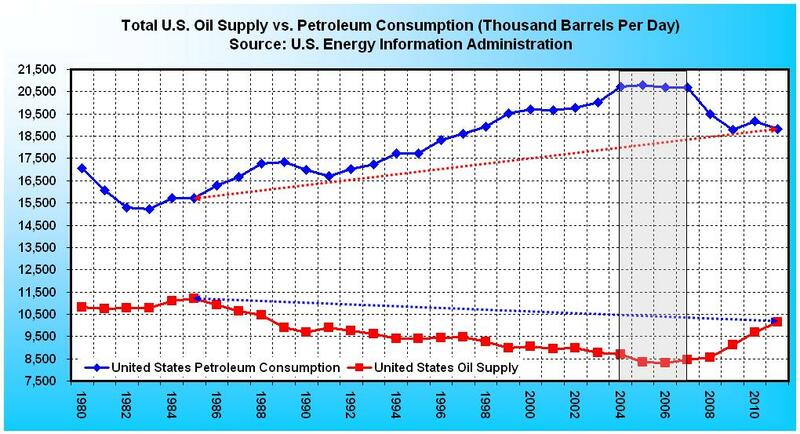 According to information from the U.S. Energy Information Administration, there was a notable rise in U.S. petroleum demand, and a corresponding decline in U.S. supply from 2004 to 2007, as indicated by the shaded area in the chart below. In fact, the phenomenon of rising demand and declining supply actually commenced in 1986. A quick study of the chart leads to two questions. Is the U.S. currently producing more oil than it did in 1985? The answer is no. Is the U.S. consuming more petroleum than it did in 1985? The answer is yes. Yet in 2009 there was a noticeable decline in demand and a corresponding uptick in supply, the combination of which contributed to lower prices at the pump. And, it appears that U.S. oil supply is continuing to trend upward, while demand has leveled off. So since demand is stable and supply is increasing, gasoline prices should be dropping like a rock, but instead we have witnessed a 94.2% price increase since January 20, 2009. So was Obama right to blame the 94.2% price hike, on what he refers to as the extraordinarily low prices he inherited as a result of an economic depression? No, because by inauguration day the price of gasoline had settled right about where it should have, on an inflation adjusted basis. Recall that in 1992 the price of regular unleaded gasoline was $1.13 per gallon, which would have been equivalent to $1.73 in 2009; and the national average was $1.64 on December 29, 2008, and $1.88 on January 19, 2009. Thus, at that time, the price of gasoline was barely above its inflation adjusted value (see the first chart). Going back to the original question, the reason prices have risen on Obama’s watch has nothing to do with supply and demand. The root cause is unprecedented government intervention vis-à-vis his $832 billion stimulus plan (see Part II). The stimulus program merely re-inflated a price bubble that existed prior to the recession, the first caused by lack of supply, and the second by devaluation of the dollar. It was this artificial deficit-financed demand that caused gasoline prices to rise from the $1.88 he inherited to $2.64 by the end of the recession, so that by June of 2009, gasoline was only 19% below its pre-recession record of $3.25. Gasoline would remain below $3.00 from June 2009, until the week ending December 27, 2010. It was during this period that the economy showed its most promising signs of recovery. But ever since then, the price of gasoline has never fallen below $3.00. Instead, in the week ended February 28, 2011 the price once again accelerated past the $3.25 breaking point, where it has remained for the last 86 consecutive weeks. With regard to 2010 being the end of the Obama recovery, the proof is that Real Gross Domestic Product (GDP) contracted by -3.1% in the year 2009, as gasoline prices surged from $1.64 to $2.62. Then in 2010, GDP grew by 2.4% as prices stabilized and remained below $3.00. But economic growth again slowed to a rate of 1.8% in 2011, as prices climbed above $3.25. GDP further slowed to a growth rate of just 1.3% through the second-quarter 2012, as gas prices remained above $3.25.